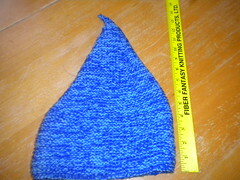 I don't have a picture of my felted bag today but I do have a picture of another felted project. 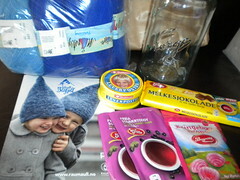 Two years ago I took part in an International Yarn Swap on Ravelry and received a lovely package from Norway. 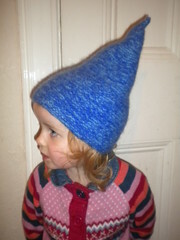 The hat pattern is a traditional Norwegian design and there was enough yarn to make two hats, one for each of my twins. 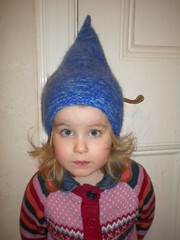 I quickly cast on and completed the knitting of one very quickly. Then it sat and the bottom of my knitting bag, unsewn and not felted. I feel a sense of acheivement as another item is complete, and I also remembered how much fun these swaps can be so I've signed up for the next one!